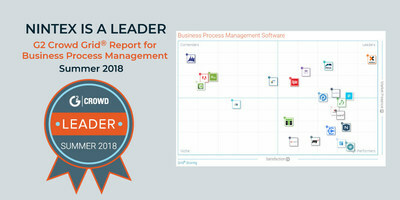 BELLEVUE, Wash., July 26, 2018 /PRNewswire/ -- Nintex, the world's leader in intelligent process automation (IPA), is pleased to announce today the Nintex Platform is the industry's top-rated software platform for easily automating business processes according to G2 Crowd's Summer 2018 Grid® Report for Business Process Management. According to G2 Crowd, a peer-to-peer business solutions review platform, business process management software helps define, automate and report on processes. This type of software is intended to optimize how businesses run and help end users to accelerate business outcomes. "Our mission is to improve the way people work through process automation," said Nintex CEO Eric Johnson. "The new G2 Crowd Grid Report helps demonstrate that our solutions are meeting customer needs and driving productivity so that they can spend their time being strategic, creative and innovative." All products shown on the G2 Crowd Grid® Report for Business Process Management | Summer 2018 are ranked by customer satisfaction and market presence and must receive a minimum of 10 reviews/ratings gathered before June 6, 2018. The report is available for complimentary download at http://www.nintex.com/BPMGrid. Nintex received the highest satisfaction scores among all products reviewed in G2 Crowd's latest Grid Report. The feedback from business process management software users is consistent with the changing nature of the market. The emergence of easy-to-use, no code solutions like Nintex redefine the intelligent automation of processes. Every day, more than 7,500 public and private sector organizations around the world turn to the Nintex Platform to digitally transform both simple and sophisticated business processes across major ecosystems like Box, Salesforce, SharePoint, Office 365 and more. Earlier this month, Nintex shared that customers using Nintex for Office 365 have surpassed 75 million workflows executions, a continued sign of momentum for no code process automation solutions. "When we upgraded to Nintex, the whole process became so simple. With basically no code knowledge, my business users can create advanced complicated workflow in SharePoint." "The software is very stable and we rarely need support but in those few instances that we do, we always receive excellent support and guidance." To view more feedback from users of the Nintex Platform, visit https://www.g2crowd.com/products/nintex-platform/reviews. Nintex is the world's leader in intelligent process automation (IPA) with more than 7,500 enterprise clients and an extensive partner network in 90 countries who have built and published millions of workflow applications. With its unmatched breadth of capability and platform support delivered by unique architectural capabilities, Nintex empowers the line of business and IT departments to quickly automate, orchestrate and optimize hundreds of manual processes to progress on the journey to digital transformation. Nintex Workflow Cloud®, the company's cloud platform, connects with all content repositories, systems of record, and people to consistently fuel successful business outcomes. Visit www.nintex.com to learn more.